A recent and somewhat controversial example of how a promotion emphasises particular elements of a text. 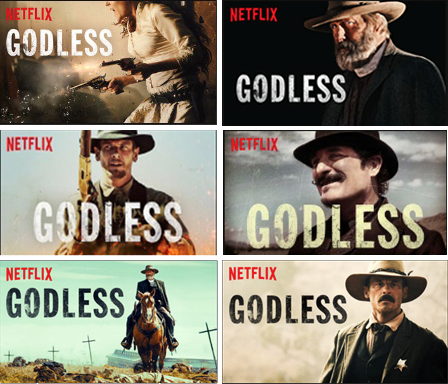 In this instance, Netflix’s Godless (2017) was initially marketed through posters and trailers as a female-oriented Western. However, as critics were quick to point out (as in the Tweet above), male characters enjoyed the lion’s share of dialogue in the pilot episode. Since Netflix debuted their first original series in 2013, House of Cards, there has been a growing body of scholarship examining the implications of the company’s data-driven approach for the production, distribution, and consumption of film and television. Almost all of this work has focused on the content itself – on the programmes that have (supposedly) been commissioned through a combination of algorithms and human instinct. However, far less has been written about the SVOD giant’s promotional practices, which, as the images above indicate, are equally worthy of study even if they have somewhat gone under the radar. 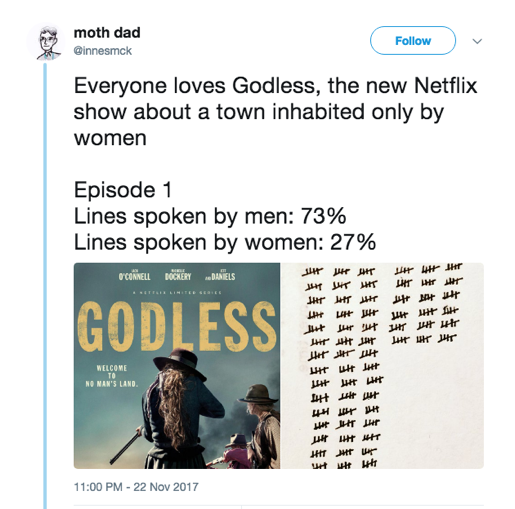 Contrary to the trailers and official poster, and despite the series’ tagline, ‘Welcome to No Man’s Land’ and its focus on a town almost entirely populated by women, there is an overwhelming emphasis on male characters in the thumbnails that are used to promote the title within the Netflix interface. It’s also worth noting that in the only thumbnail I could locate featuring a female character, only half of her face is visible. This post examines Netflix’s algorithmic promotional practices, setting them in relation to a longer history of marketing in the entertainment industries. By doing so, I hope to draw out some of the key similarities and differences between analogue (for want of a better word) and algorithmic advertising, and to briefly consider some of the implications of these emerging practices for how we choose, interact with and experience content via services such as Netflix. Whilst these definitions and functions of “analogue” promotional paratexts map neatly onto more conventional marketing practices, they are less effective at describing the algorithmic approach employed by Netflix. For one thing – and here is where algorithmic and analogue practices begin to diverge – there is often no single promotional thumbnail for a title. Instead, many series and films – particularly Netflix Originals – have multiple thumbnails which are selected and then displayed depending on a range of different (and largely invisible) factors. 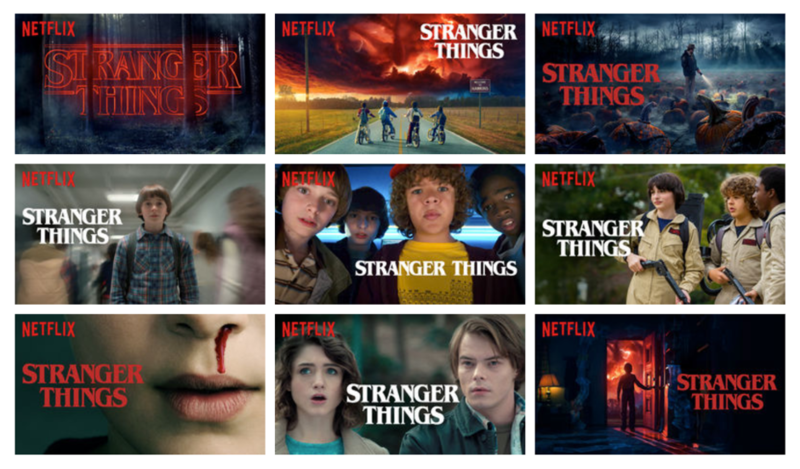 Take for example, Stranger Things, which according to a recent Netflix Tech Blog has at least nine different thumbnails. The nine thumbnails for Stranger Things that have achieved a 5% or greater rate of engagement. Though many of these thumbnails reinforce genres that we might already associate with the series, such as sci-fi or horror (in particular, the top row and the bottom right image), others seem somewhat less representative of the programme. For example, the bottom-middle image (featuring Nancy and Jonathan) emphasises the relationship between these two characters, thus promoting the series through a very different generic lens (i.e. drama, teen romance), perhaps even encouraging viewers to foreground this plot over others. Other thumbnails, such as the one in which Mike, Dustin and Lucas are dressed in replica Ghostbuster’s costumes exaggerates the series more comedic elements, thereby appealing to viewers who may be less interested in sci-fi, horror, or even romance, and ultimately resulting in a different framing and a potentially different interpretation of the text. Of course, a diversified marketing campaign that promotes different generic traits of a text in the hopes of attracting a broader audience is hardly a novel approach in the history of media entertainment. Take for example King Kong (1933), a film well-known for such a strategy. As Cynthia Erb explains: ‘its reception dynamic was a comparatively mobile, shifting one, in which distributors and exhibitors kept recalculating the terms of the campaign in an effort to re-present the film’s features in their best (and most profitable) light’. [ (( Erb, Cynthia (1998) Tracking King Kong: A Hollywood Icon in World Culture. Detroit, MI: Wayne State University Press.))] This involved, amongst other things, pitching the film’s different genres – romance, action, “jungle movie”, etc. – to different kinds of audiences, often in different, gendered promotional spaces. One of many promotional stills taken for King Kong (1933) to emphasise the film’s more romantic elements. This approach has long been practiced within the entertainment industries and in principle is no different to the promotion of titles on Netflix, which similarly utilises a range of promotional imagery in order to appeal to different consumer interests and identities. At the same time, however, it constitutes a fundamentally different process, one that lacks the automated, instantaneous and highly-personalised characteristics of Netflix’s algorithmic model. In the case of the Netflix interface, not only does this mean that we are perhaps more likely to be offered the same kinds of content that the algorithm thinks will appeal to us (thereby diminishing the possibility of serendipitous discoveries), but that the promotion of these titles is increasingly personalised in such a way as to appeal to and further reinforce our generic preferences. Moreover, as scholars such as Genette and Gray have demonstrated, paratexts such as these produce certain kinds of framings and interpretations of a text, as per the Stranger Things thumbnails above or the Pulp Fiction examples below. An example of how thumbnail personalisation works on Netflix based on a users’ viewing history. In this instance, the promotional artwork varies by star rather than genre. To be fair to Netflix, the company has publicly acknowledged the limitations of algorithmic curation on more than one occasion via their Tech Blog, with several posts [1, 2] detailing the various measures they have taken in order to avoid creating the kind of algorithmic echo chamber as described by Kihn. Nevertheless, the development of highly-personalised, algorithmically driven promotional thumbnails does suggest that we are now at a new frontier of marketing, one that has profound implications not just for what the promotional machine allows us to discover (or not to discover), but also in terms of how it increasingly encourages us to view the same texts through very different and highly-personalised promotional lenses. The politics of personalisation. One final example which illustrates how personalisation can be used to draw attention away from certain actors/characters. 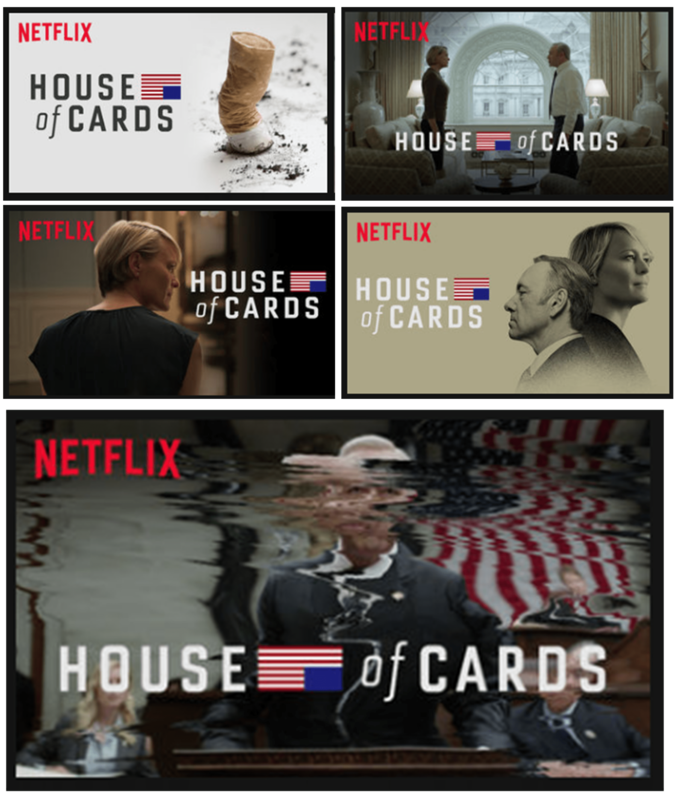 In this instance, Spacey no longer features as the main or only figure in Netflix’s promotional thumbnails for House of Cards, with his face even distorted beyond recognition in the final image above.